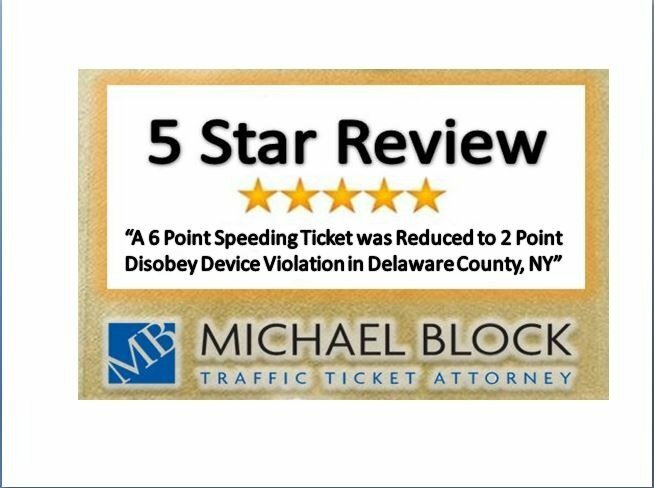 Another happy client had a 6 Point Speeding Ticket in Colechester Town Court located in Delaware County, New York reduced to a 3 Violation! Speeding tickets are fairly common in New York and range in cost as well as license points depending on how fast you were going over the speed limit. Our client received a 6 point speeding ticket because they were driving 81 MPH in a 55 MPH speed zone (that’s 26 MPH over the legal limit). If you are ticketed for speeding, we can fight for you. Call for free legal advice on Speeding Tickets at (212) 227-9008 or email us at MichaelBlock.law@gmail.com. The most important advice we can offer at this moment is to fight the ticket. Do not simply mail in a payment or pay the DMV online. This will result in a guilty plea and points on your license which can raise the cost of your insurance. A speeding ticket lawyer is waiting to help you. New York Traffic Ticket Law can be very damaging to your driving record. My advice is: don’t pay that traffic ticket. Take a moment now to share a few details about your ticket here. We always fight for the most favorable outcome and are always glad to have great results for our clients. If you’ve received a speeding ticket or any other type of moving violation, let us help you! Email us at michaelblocklawyer.com or call (212) 227-9008 to learn how we can defend you. We fight tickets all over New York, including: Queens, Manhattan, Brooklyn, Bronx, and Long Island.